Jura-ninja is a very easy going mancat. There's not a nasty bone in his rubbery body so we were somewhat taken aback by a recent comment from my royal fellow blogger, King Spitty. He stated that Jura had, in his opinion, 'evil' eyes in a photo in which Mirsku was being chased. Pöh. This is höpsis, nonsense. And luckily Jura does not care. 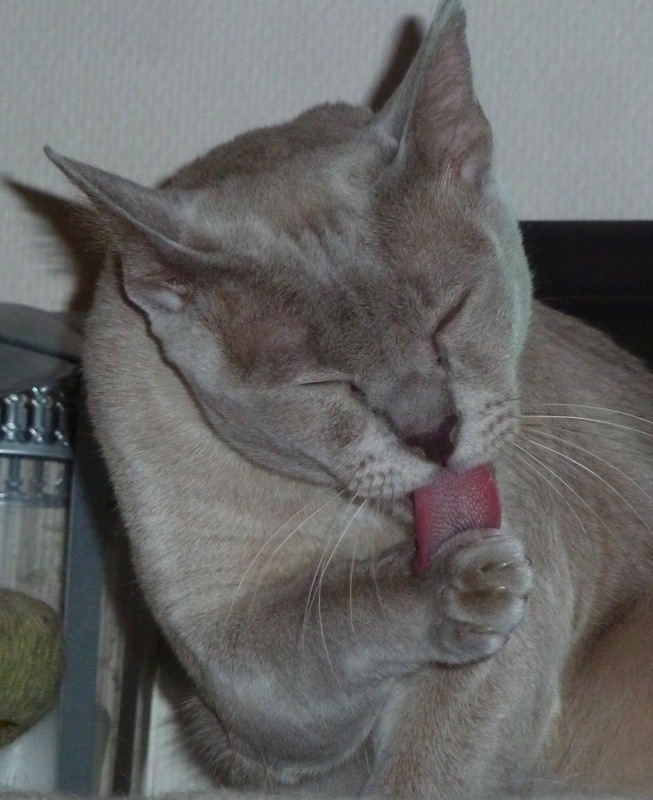 Instead he pays most careful attention to his personal grooming. He cleans very carefully between his delicate paw pads, and makes sure that all the snaggy bits are removed from his claws to make them razor sharp. And even those tongue hairs could do some damage. But of course Jura does not think of such things - especially when he is tearing all over the house chasing his sister. Including running across Äiti's face as he just doesn't let anything ruin his ninja fun. If only he realised he's going to get his little nephew moving in soon, then the chases will really begin. Well, of COURSE he looks all inoocent in that first picture! His eyes are closed! 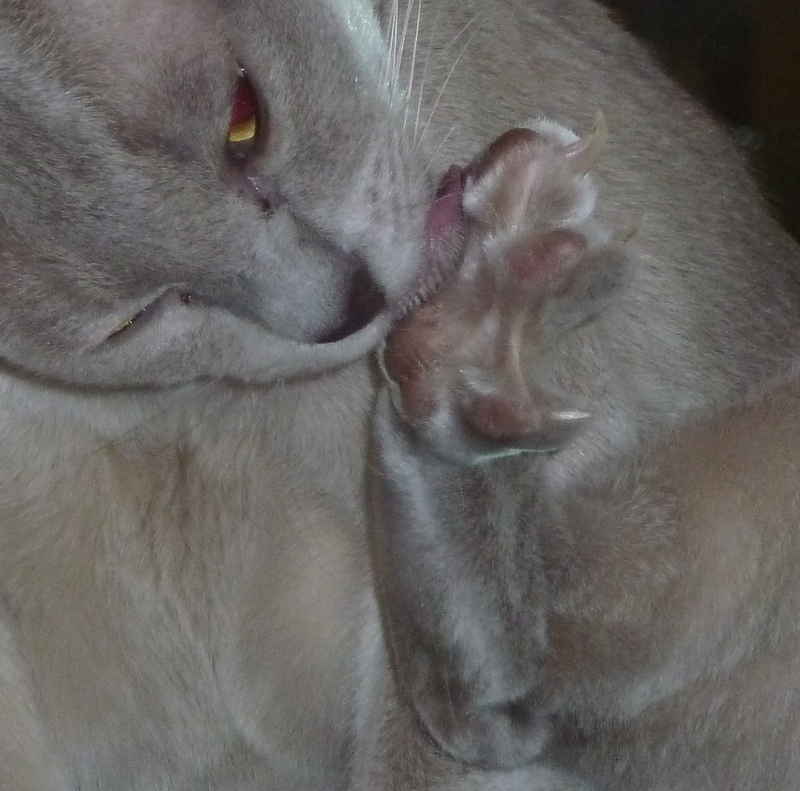 I will grant you that he is doing a very thorough job of toe cleaning, making certain his claws are in tippy top shape. You might have needed those had I not called off the badgers. Wowwzers! A man Cat after my own heart! Mes LOVES to keeps my nails in tip top sharpness! That's exactly what we were thinking. Just wait til the wee one comes to stay. The fun will begin! Aiti may have to sleep in protective clothing! MOL! He better rest up for when that whippersnapper arrives!! Heh, aren't ALL we kitties supposed to be evil, according to some misguided humans? I kind of like to have them a bit wary of me. Jura is a confident, secure, well-balanced kitty. Mean bones are simply not needed. We love the close ups. Maybe one of mum's exquisite portraits next? Wow, those are some clean toes! hmmm. Could it be the evil is hiding and Jura is POSSESSED? We think that's what's up with our Maui...he's crazypants, you know. None other cleans like you Buddy... that's for sure! He is making a first class job of cleaning those toes. We notice he has very manly whisker humps too.